Check out my creamy, delicious kale and spinach salad! In a large bowl, pour out some triple washed organic spinach. Rinse a few sprigs of curly kale, dab dry, and tear apart with clean hands. Peel and slice an organic Hass avocado and use 1/2 to 2/3. I cook up a cup (dry) of quinoa every few days so I always have a healthy, quick snack or start to a meal ready to go. 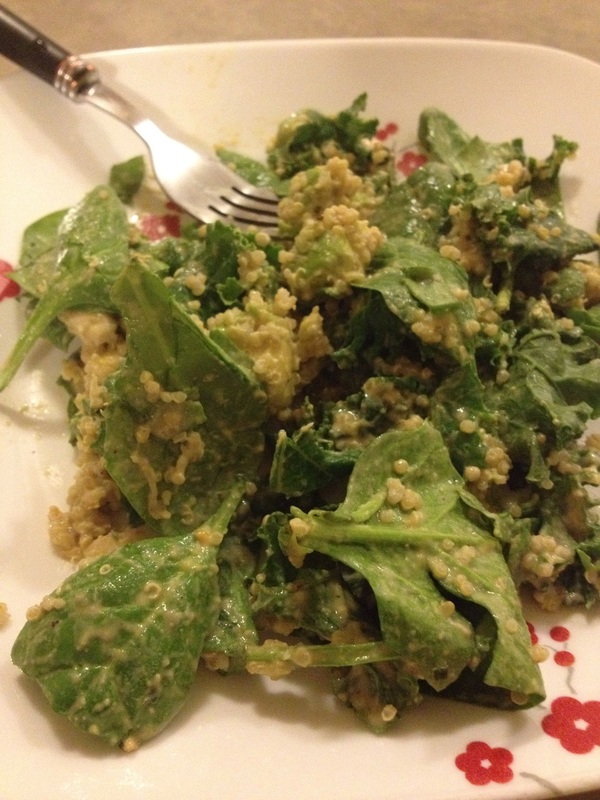 Add in some cooked quinoa, an oil-free baba ghannouj, lemon pepper, and an oil-free, sugar-free, vegan dressing. Looking for a butter substitute? Try fresh avocado! Avocado is a naturally creamy, satisfying fruit that I couldn't live without. I split my salad with Scott so to make this a meal. I also made a second course of a baked potato. I cut open the potato and mashed in the remaining avocado. Scott topped it off with salsa, and I opted for nutritional yeast, which is a B-vitamin rich sodium-free seasoning. Try avocado on toast or in a pasta dish to make your plant-based dinners as creamy as you desire. Avo-fredo!